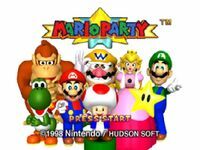 "Mario Party (マリオパーティ , Mario Pāti) (often referred to as "Mario Party 64") is a party video game for the Nintendo 64 game console, developed by Hudson Soft and published by Nintendo. It was released in Japan on December 14, 1998, followed by a North American release on February 8, 1999, and a European release on March 9, 1999. In May 1998, Nintendo and Hudson began a partnership to design and develop games together for the Nintendo 64. Mario Party was the first of the games that the partnership released." Source: Wikipedia, "Mario_Party_(video_game)," available under the CC-BY-SA License.